Are You Making the Most of the Features Sage 200 Has to Offer? Sage 200 is probably something you use every day. You log in, go about your daily tasks and log out. It does what you need it too. But, are you using it to its full potential? My guess is probably not! Sage 200 is full of extra functionality & features to make your job easier and your business better equipped! Here are my key features that you should be using! Sage 200 Business Intelligence is ultimately a data analytics tool. It pulls across all of your Sage data (usually overnight), and allows you to create/view reports. BI is included as standard with Sage 200 and also comes with lots of pre-designed reports for you to use or change at your will. These range from finance reports like Trial Balance’s and Actual’s V Budgets to Stock Movement and Top 10 Customer Reports. You can find these pre-designed reports in your Sage 200 toolbar menu. 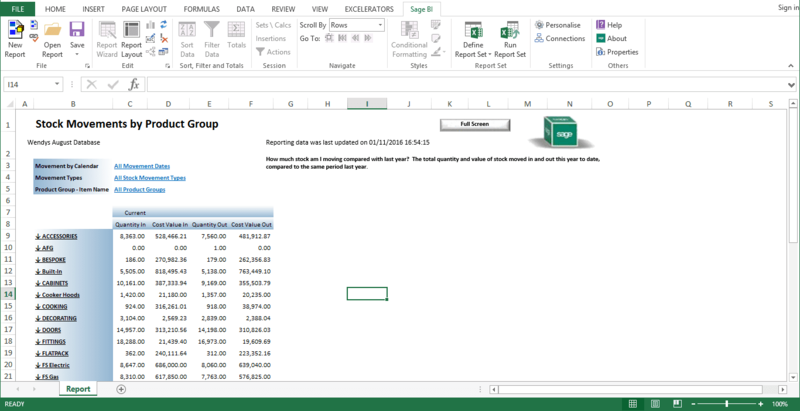 As BI runs in Excel it is very easy to edit or even create your own reports, and it doesn’t just have to be for your Sage data! You can connect BI to any Analysis Services Database. If you are interested in learning more about Sage 200 BI, why not sign up to our online training course! The Sage 200 Workspaces allow you much more freedom than the ‘traditional enquiry’ screens. You are able to add in much more detail in the Workspaces, allowing greater visibility in your data. The modules of Sage are pretty much mirrored in the Workspaces, and the data in there is all live. Some show graphics and allow you to filter certain areas of your data, and the data in the Workspaces can also be exported to Excel. Think of them as a hybrid of your Sage Reports and your Enquiry Screens within Sage 200. The Sage 200 Bank Feeds, allow you to link up your Online Banking and Sage 200. This means you can download your transaction from your Bank Account into Sage 200, and reconcile them with the transactions in Sage. The Bank Feeds work by using a third party Yodlee, who take your Bank Data and then upload it to Sage. Once the transactions are in Sage, you can match them to your Sage transactions or create new ones, ensuring that every transaction on your Bank Account is mirrored in your Accounting System. Sage 200 Bank Feeds are only available for certain Banks & Credit Card providers. For more information on setting up Bank Feeds, contact one of our team who will be happy to help. Within Sage 200, you have a number of default imports available to you. These range from Sales Transactions to Nominal Budgets. For many of these process, like for example Nominal Budgets the alternative way to input these would be to Amend the Account Details with each budget. However, this can be extremely time consuming and laborious. The Sage 200 CSV imports allow you to create an Excel document with the required budgets/transactions/accounts and simply import straight in! For guidance on importing CSV’s successfully, check out our blog! Home » Sage Blog » All Sage Blog Posts » Are You Making the Most of the Features Sage 200 Has to Offer?